The Hampton Roads Chapter of Case Management Society of America will promote the growth and value of case management to support the evolving needs of the case management professional. The Hampton Roads Case Management Society Chapter (HRCMSC) will be the premier association for case management and case management professionals in Hampton Roads Virginia. The Hampton Roads Case Management Society (HRCMS) is a chapter for the Case Management Society of America (CMSA). We represent the Hampton Roads region of Virginia, including Virginia Beach, Norfolk, Chesapeake, Portsmouth, Suffolk, Isle of Wight, Smithfield, Franklin, Hampton, Newport News, Williamsburg, Yorktown, and the Eastern Shore. Formed in 2007, HRCMS has steadily grown to over 120 members. We meet bi-monthly and provide educational seminars for our members. These seminars, as well as our annual conference provide CCM continuing education credits. Participation in committee and chapter leadership is available and encouraged. Please click the link to view the Bylaws of the Hampton Roads Case Management Society. In the picture from lt. to rt. is Aline St. Amour Treasurer, Mildred Mc Nally Past President, Gail Brown President, Angela Futrell CEO, Valda Branch COO and Khalilah Le Grand Public Relations and Fund Development Director. Our dedication as a healthcare professional organization is to give back to the community. The Peninsula Institute for Community Health(PICH) is a healthcare initiative to serve the insured, uninsured and underinsured in Hampton Roads. They have seven community healthcare centers providing primary care and dental services to individuals and families. 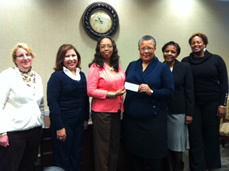 On Dec. 5, 2010 a check was presented to support their efforts. HRCMS President Millie McNally and Vice President Gail Higgs-Brown present a check to the Hampton Roads Community Food Bank 2010. The Hampton Roads Case Management Society (HRCMS) is committed and dedicated to serving the local community. At a time when food banks are depleting their shelves and the economy is "stretched", the case managers took action. During the November 9th, 2010 educational meeting, a food drive was held. Members attending were asked to bring in canned goods and non-perishables food items. Money was also graciously donated for the cause. On November 11th, 2010, HRCMS President Millie McNally and HRCMS Vice-President Gail Higgs-Brown delivered the food items and presented a check to CEO Stephen Terveer and COO Stephen Barth of the Hampton Roads Community Food Bank. The chapter has decided to make this an annual event in support of the Hampton Roads Food Banks.